Invisalign in Weatherford Can Successfully Straighten Teeth! There are many patients who suffer from the after-effects of bullying, especially when it comes to their smile. Meet Sandra, a mom, and entrepreneur. She explains her issues with teasing in grade school throughout high school about her gapped teeth. It detrimentally affected her confidence and she didn’t want to let her daughter see her down. Thankfully, she stumbled upon a revolutionary straightening treatment that changed her life for the better: Invisalign. Not only was she able to fix her smile as an adult without altering her mature image, but she was able to restore her confidence. Now she leads a stronger example for her little one. If you would like to learn more about Invisalign in Weatherford, keep reading. Your dental family is here to support you and show you how to get the most out of your Invisalign treatment! You too can be a success story. Invisalign clear aligners use several custom trays during your straightening process. Your dentist will take impressions of your teeth, consider the correct positions they need to be shifted to, and create clear aligners that will gradually shift your teeth appropriately. They constantly apply gentle pressure to guide teeth into the correct locations. As you get further into your treatment, you will replace each aligner with the next in the series until your teeth have shifted to the correct positions. If you’ve done any research on orthodontic treatments, you know that traditional metal brackets and wires really bothersome and uncomfortable. Most people complain about their teeth and gums being sore, their jaws hurting when elastics are added to their treatment, and or their soft tissues being damaged. Thankfully, patients can relax with Invisalign! When you choose to use the Invisalign treatment, the process is gradual and comfortable. Most patients experience slight pressure after switching out their old aligner for a new one. A bit of tightness is just a sign that your treatment is working to gently shift your teeth. 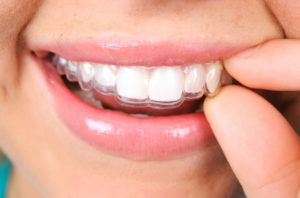 The length of your Invisalign treatment depends on your dental issues and their severity. This can be determined during your scheduled appointment with your orthodontist or dentist. Typically, the average case takes about 8 to 12 months. That’s a cake walk compared to traditional treatments! The best way to clean your aligners is to use the Invisalign Cleaning system. This system keeps your aligners odor-free and constantly clear so that your peers can’t tell you’re wearing them. Keeping your aligners clean is one of the most vital parts of your treatment and will help the process run smoothly. If you’ve been searching for a way to improve your smile without damaging your professional appearance, you’ve stumbled upon the best Invisalign provider in Weatherford. Not only are Dr. Romack and Dr. Mulkey passionate about helping people love and care for their smiles, they’re dedicated to finding convenient ways for patients to do it. If you would like more information, feel free to reach out to our Weatherford office. by: Dr. Deborah Romack at October 20, 2017 . Comments Off on Invisalign in Weatherford Can Successfully Straighten Teeth!